Look At All The Funny Shapes! 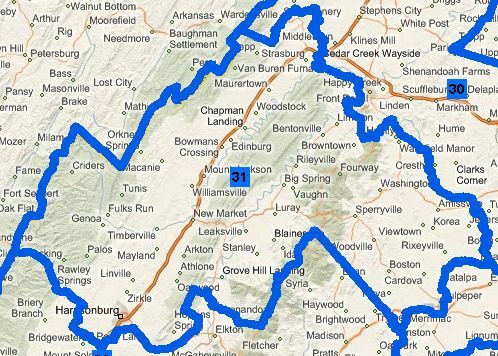 As I continue my exploration into the world of gerrymandering, yesterday Virginia’s Division of Legislative Services released three suggested redistricting maps, one for the House of Delegates and two for the Virginia Senate. In this article, we will be focusing on the Senate. Is there significant gerrymandering in the system? Absolutely. Along the border with North Carolina, one can find bizarre images. Going from west to east, something is a bit off with the 19th, 15th, and 18th districts. And look at Creigh Deeds’ 25th. It includes his home in Bath County next to the West Virginia border and then travels along a narrow corridor until it widens to pick up the liberal city of Charlottesville and the surrounding area about 100 miles away. Is it only foolish hope to expect anything better? Help is on the way! As stated, there are two plans circulating, one Republican under Senator John Watkins from the 10th and one Democratic from Senator Janet Howell of the 32nd. Let’s first tackle the Watkins plan. The first thing you might notice is that the number of your Senate district has likely changed. I’m not sure why he would alter the numbering system. It seems to me to be an unneeded annoyance. More importantly, is there gerrymandering in the Watkins plan? You bet! 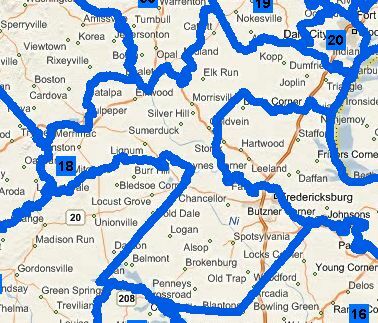 First, he maintains a fair number of gerrymandered districts from the current map, such as the 37th. The 37th (formerly numbered the 19th); with its trunk and reaching branches, it sort of looks like a tree. Holy smokes! A mushroom cloud! Is someone launching nukes? No, that’s only the proposed 18th district. The 31st (formerly the 26th) may not seem too gerrymandered, but as a resident of the city of Harrisonburg, I can tell you that I’m not too happy about it. If the district needed to grow, why wouldn’t it expand south to include most, if not all, of the remaining portion of Rockingham County? Instead, it leaps over the Blue Ridge Mountains to pick up part of Culpeper County. Why, oh, why? Let’s move on to the Howell plan. Is it better? I’m grateful that Howell doesn’t modify the numbering scheme, but that alone doesn’t make it a worthy suggestion. First off, you’ll note that Howell’s plan retains the heavily gerrymandered 25th. In addition, sort of like the proposed 31st under Watkins, the 24th district sneaks across the Blue Ridge to include part of Culpeper County. But there are other offending districts, too. What’s going between the 20th and the 15th? I used to draw similar shapes when I was bored in school. What is the conversation here? We need the city of Danville and the eastern part of Pittsylvania County in the 20th. What about the western portion? Stick it in the 15th! While we are at it, let’s give the 15th a nice new hat by including Amherst County too. And how much, if any, of the 19th district is within it’s current borders? If you draw an eye around Lazy Oak Corner, one can easily see the 18th district as a monster looking to consume the western half of the 13th. Just plain ugly. I’d include more maps, but with each new image WordPress is taking more and more time to upload them. Instead, I invite you to explore the redistricting website yourself. Chances are, you’ll have to download a new plugin to make the site work. You should note that I haven’t even begun to consider party gains under these two proposals. Nevertheless, I’d wager that the Watkins plan will result in more Republican victories while the Howell proposal will do likewise for the Democrats. Both have their share of flaws and obvious gerrymandering and should be rejected…or at least heavily modified. At the end of the day, I hope that the General Assembly refuses both of these plans and draws compact districts with not quite so many funny shapes. I appreciate your story. I wish more people would be like Paul Mathison and take an active role in politics. When elections are rigged before they take place through gerrymandering, are we really better off that those despots who stuff the ballot box? Thank you so much for bringing this to my attention. I never even considered this as a problem before but you make your case very well. I’m going to look at gerrymandering in my own state and see what I can find.